Subwoofer under the passenger seat? I have to have music on when I'm driving, but I have to turn it up so loud in order to hear the base line that I can't talk to my passenger. The wind and road rumble just overwhelm everything. So I'm thinking of putting an "under-seat" powered subwoofer under the passenger seat, something like the Rockville USS 10". I'd have to undo the star bolts and remove the swivel seat to get access. There is already a bundle of wires under there, so I'm assuming there's some easy passage to the dashboard to hook up to the receiver/CD/thumb-drive player adn get power to it. Are there any gotcha's I haven't anticipated that would make this more difficult than it looks? Personally, I think you will be disappointed by even the best under seat sub setup. An externally amplified system with a quality woofer and speakers is key to a nice setup you won't likely redo several times. I'm running a 5 channel amp with a JL Audio 8W7 subwoofer, CDT front component speakers and generic rear 6x8s. This setup is decent and allows nice sound quality without being overly loud or overbearing. So I'm thinking of putting an "under-seat" powered subwoofer under the passenger seat, something like the Rockville USS 10". I'd have to undo the star bolts and remove the swivel seat to get access. There is already a bundle of wires under there, so I'm assuming there's some easy passage to the dashboard to hook up to the receiver/CD/thumb-drive player adn get power to it. The passenger seat area is a great location of car stereo electronics and there is good access to the driver seat and dash. Do you have a stock system now? I agree with Redoval that just adding an under seat sub will likely not get you the sound you want. Replacing the stock 5.25" door speakers with 6.5" separates will be your biggest bang for the buck, ideally with an amp. I started by adding a 4-channel 180 wpc amp under the passenger seat, 6.5" Focal Expert speakers in the doors and a pair of 10" Morel Hybrid speakers in the ceiling at the back in the dead space between the back of the poptop frame and the rear doors. After listening for a while I added the Kicker Hideaway sub under the passenger seat to round out the low freq. Adding the sub later was easy since all the other wires were already run to the seat, but I'd say the sub was only a marginal improvement. Good for the front but not enough to make much difference in the back. Do you have a stock system now? There's nothing stock in the sound system. I had SMB replace the stock radio with a Kenwood DDX318. Then I replaced the door speakers with Polk 5.25" coaxal speakers, and the little windshield speakers with 1" titanium dome tweeters. When parked, it sounds great, but as soon as I get a little rumble from the road, the bass is drowned out, even with the bass turned up all the way on the Kenwood. I don't want to put any speakers in the back because the lack of bass is only an issue when I'm driving. Thanks for your responses; it sounds like (is that a pun?) under the passenger seat is the way to go. Here's a picture of my setup. The Amp and sub are mounted on platforms and angled so the controls are accessible from the small access door, and I put sheets of MLV dampening to prevent vibration. Looks sweet! Seems like that's my next project. Now I'll have to do a little Amazon browsing to see what will best fit my needs. Thanks for the reply! Do you have a swivel passenger seat? Yes. And the driver's seat is too, but there's already stuff under there. 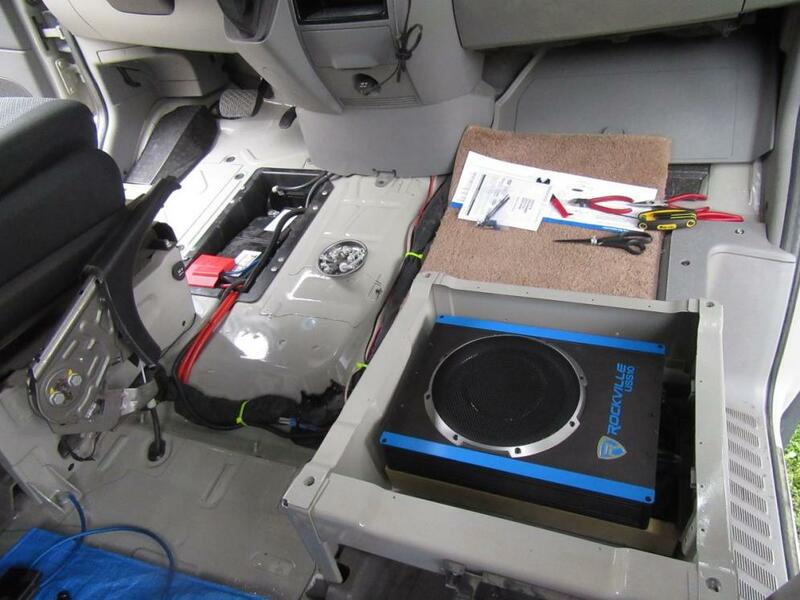 I finished the installation today of a Rockville 10" powered subwoofer. It was pretty simple but there were a lot of steps (and going back and forth to my workbench to get the tools) so it probably took 8 hours total to get the seat off, measure everything, get the floor up, get the 'radio' out, get the wiring in, get the subwoofer installed, and then put it all back together again. There are convenient wire channels under the floor that go to the battery and the dashboard. I mounted the volume control knob next to the gear shifter, on the driver's side. I can up the bass more if the road is really noisy. Music sounds a lot better now! We CNC subwoofer panels for the Sprinter. The panel locates in the large middle opening in the lower wall behind the driver on all NCV3 models. A 10" shallow mount sub will fit this space with an amp under the passenger's seat or also in the wall if needed. 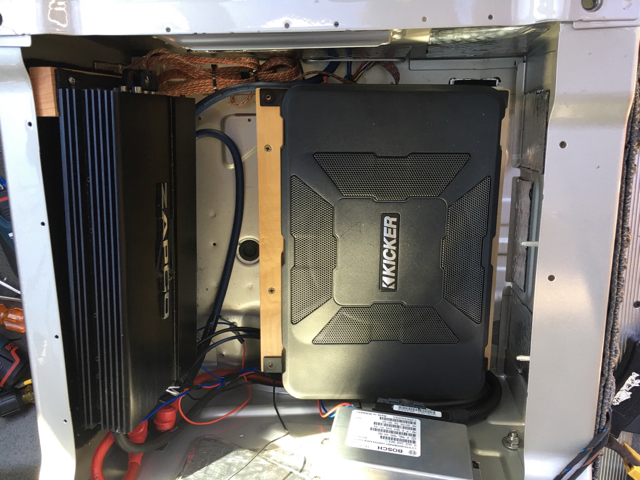 We recently produced a similar panel for a Transit and used an Alpine PWE-S8 powered sub which simplifies installation (no separate amp). The 8" Alpine sounds as good as a 10" with separate amp. We also produce speaker adapters for the front doors that allow for a larger 6 1/2 or 6 3/4 speaker. This is a great improvement over the OEM or aftermarket 5 1/4" speaker.